Outdoors activities on the East Side: road biking. What’s your favorite outdoor activity to practice on your free time?? I must say, for us, it’s hard to pick one: there are so many wonderful choices! Do you like to hike? Run? Climb? Fishing? Golf? Road bike? MTB? Ski? Yoga? Swim? Skateboarding? Photography or nature painting? ...We can keep going! The Eastern Sierra has them all! So, today I want to talk about road biking. The famous Mammoth Fall Century & Gran Fondo is coming up, and we know a lot of people that are going to do it! Road biking around here is pretty awesome! First of all, Mammoth as lots of paved bike paths thoughout town, bike trails etc. There might not be too many dedicated bike paths outside of the town's Bike Paths, but certainly the roads around here offer some spectacular riding! The shoulders are usually pretty wide, and as soon as you get out of the HWY395, you have lots of low traffic, gorgeous views, usually good pavement roads, for miles and miles to pedal! As many as your legs can handle! The Mammoth Fall Century, which this year is going to be on September 9th, is a top-level cycling event in an amazing landscape! It offers three different options as far as lengths: the “Piccolo”, 42 miles; the “Medio”, 70 miles; and the “Gran Fondo”, 102 miles. 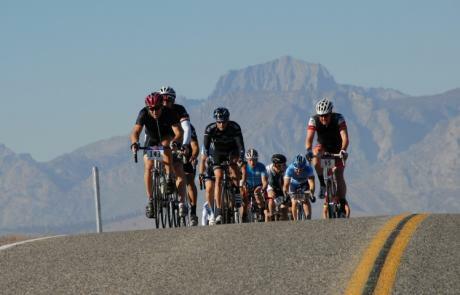 The courses start and end at the Village, so riders beware, you are going to have to ride back up to HWY 203 from HWY 395: a hill almost 4 miles long to conclude your effort. But the rewards are going to be worth it! The roads, the views, the vibes, the refueling at the 6 aid stations along the course (for the Gran Fondo distance), the food and the party afterward will make all your efforts to pay off! So, hey, are you into road biking? Local or not, give it a try! If you have not been training Summer long like a pro, you can still dust your bike off, ride for the next month and give the "Piccolo" a chance!